2016: The Year of Thailand&#039;s Quantum Ethnic Communities? Home > 2016: The Year of Thailand's Quantum Ethnic Communities? Back in 2003, Thailand ratified the 1966 UN International Convention on the Elimination of All Forms of Racial Discrimination  (CERD), though it does not recognize the competence of the relevant Committee under Article 14 of the Convention regarding an individual complaints mechanism. In 2011, Thailand submitted its Country Report for the first through third reporting cycles (2003-2008). This report is a mandatory read for anyone interested in any of Thailand's ethnic communities and is available here . However, this official version lacks the tables, which are, nonetheless, available here  in an advance unedited copy. The main difference appears to be in the paragraph numbering. What is also extraordinary is that the Country Report recognizes ethnic groups which have not officially existed for over one hundred years, most interestingly the Lao of Isan (Northeastern Thailand) and the Malay of the Deep South. The reason these groups ‘disappeared’ is closely linked to nation building during the late nineteenth century, in the case of the Lao including the integration of large parts of the Lao states of Champassak and Vientiane on the Khorat Plateau into the Kingdom of Thailand via the Thesaphiban reforms. For example, the two monthon (‘circles’) which included the word ‘Lao’, Lao Kao and Lao Phuan, lost their ‘Lao’ label and became instead Isan (meaning northeast in Sanskrit) and Udon (meaning north in Sanskrit) under the Thesaphiban administrative reforms of Prince Damrong Rajanubhab, as reflected in the 1897 Local Administration Act. At a second level, there was a disappearance of the Lao from officialdom, most visible in the official censuses. This was a reaction to the internal re-organizations as well as to Western race theory and the problem of French colonialism, which took the stance that all of Siam’s tributary states, especially the Lao and Cambodian ones, were up for grabs, a stance it enforced in the Pak Nam Incident  and the 1893 Franco-Siamese War . Almost everyone from what is now known as the Tai-Kadai ethnolinguistic family became ‘Thai’ during this period in terms of their ‘race’, according to Thai censuses, beginning with the 1904 census. In a broadly parallel process, the Thai Malay, though actually from the Austronesian language family and quite clearly not so related to the Thai in terms of customs or religion, also disappeared, with the invented ethnonym ‘Thai Muslim’ coming to replace the name ‘Malay’ in an attempt to suppress any attempt to link Thai Malay culture with the culture of those in Malaysia. Historically-speaking, this was an understandable decision at a time when communism was rising and both the borders and stability of the ‘new nations’ of the postcolonial era were still somewhat fluid. 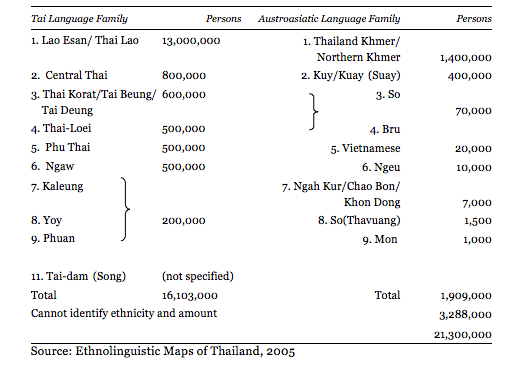 As can be seen in this table, there are 13 million Lao in the Northeast, with another 500,000 being labelled Thai Loei, though the language of the Loei ethnic community is, in fact, a dialect of Lao, that of the Luang Prabang subfamily. 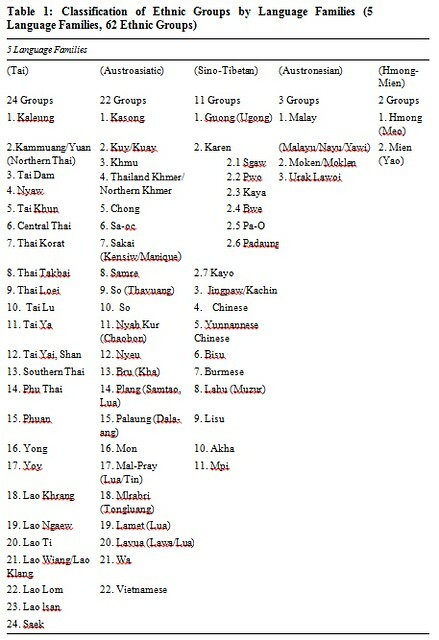 Furthermore, Thai Khorat is arguably a creole of Thai and Lao. 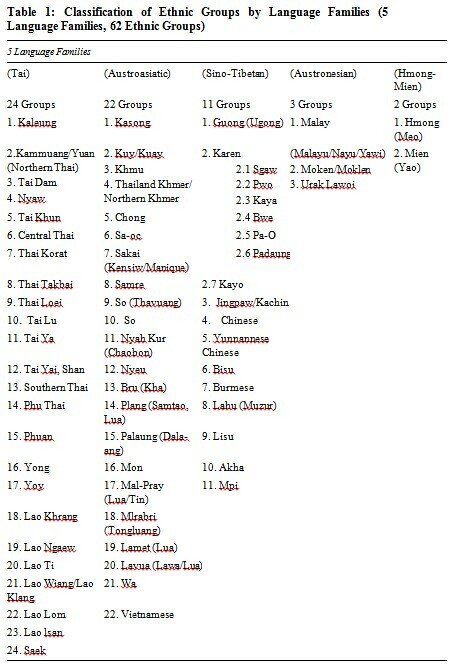 In addition, there are a further 3.288 million in the table whose ethnicity is not identified, many of whom could be partially Lao. Thus, we have an ethnic minority which is around 15 million strong in the Northeast, the majority of whom are, quite accurately and in line with the scientific consensus, labelled ‘Lao’. Thus, the Thai Malay and Thai Lao exist in a quantum state. In fact, almost all the ethnic communities in the Country Report, except for very small ethnic communities, such as the ten highland peoples of the North and west who have been officially recognized due to their problematic status since the days of the Tribal Research Institute, exist in such a state. The reason why recognizing the Lao, Malay, and for that matter the Northern Khmer is especially important is that these ethnic communities have their own states: the People’s Democratic Republic of Laos, Malaysia, and Cambodia. Thus, on the eve of the integration of the Asean Economic Community, this highly progressive recognition of Thailand’s wide variety of ethnic communities should be celebrated as a major step forwards in terms of ASEAN relations and potentially fruitful social and economic transboundary effects. But only if it can be materialized through national legislation, such as the draft National Language Policy. The Kingdom of Thailand interprets Article 4 of the Convention as requiring a party to the Convention to adopt measures in the fields covered by subparagraphs (a), (b) and (c) of that article only where it is considered that the need arises to enact such legislation. During the committee’s considerations, this reservation was described as being “so broad that the Committee could not tell which obligations the State party was prepared to accept”; moreover, the nature of this reservation has been formally objected to  by multiple other state parties, namely France, Germany, Romania, Sweden, and the UK. This year, Thailand will have a choice about what to do regarding the ethnic communities which disappeared as a reaction to decades of systemic socio-political and cultural processes involving colonialism, imperialism, and forms of fascism. It will either make progress with its human rights as regards ethnic communities, in cooperation with the Committee responsible for CERD, and raise its reservation regarding Article 4, or it will have to explain to the international community what the problem is. However, as the CERD does accept shadow reports from civil society and the National Human Rights Commission of Thailand (which did file a shadow report  last time, as did the highland peoples ), the voices of those larger ethnic communities who have re-appeared may also be heard. When that happens, the quantum nature of Thailand’s larger ethnic communities will start to collapse, which, if managed properly, will be a great opportunity.